This weir/sluice gate allows excess headrace water to flow back into the River Bollin some metres below. The sandstone bedrock can be clearly seen but unclear whether natural or excavated. Pan left SJ8382 : Headrace sluice, pan right SJ8382 : Quarry Bank Mill and Headrace. 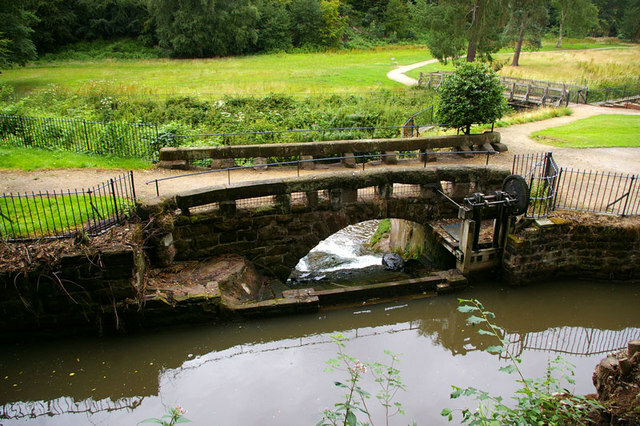 The bridge is similar in design to the bridge at the north end of the mill; see SJ8383 : Packhorse Bridge at Quarry Bank Mill and SJ8383 : River Bollin, Quarry Bank Mill.